BECKHOFF Automation will showcase its universal automation toolkit for shipbuilding at the SMM 2012. 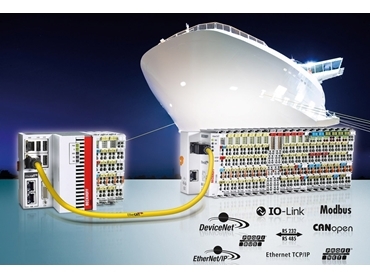 The multipurpose component kit is designed for all automation tasks on ships to allow complete control and measuring solutions to be configured. Ships require complex automation tasks such as machine control to be solved, depending on type and utilisation. One of the main tasks on freighters involves the control of loading and unloading cranes. Additional room control is required for instance, on passenger or cruise ships. The challenge for shipbuilding suppliers is to realise these different automation tasks with the smallest possible number of different control systems, which in addition should have standardised interfaces. Beckhoff components are used in a wide range of applications such as engine room monitoring and pumping of liquids. Through the use of the latest processors, PC-based control makes a powerful automation platform available for the acquisition and processing of all process data. Thanks to the open interfaces and support for all communication standards, PC-based technology can be used for central control applications such as cooling on refrigerated cargo ships, and for decentralised monitoring of individual tanks or containers. The robust, powerful PC controllers are designed to cope with shock, vibration and extreme temperatures in industrial applications. Beckhoff controllers are finely scalable in terms of price/performance with the portfolio ranging from powerful multi-core processor PCs to compact control systems for the price-sensitive individual room control segment. PC-based automation integrates extensive measuring and control technology on a single platform and enables decentralised acquisition and storage of all process data. Fill levels, temperatures, pressure, volume flow, voltage, performance, position, velocity, acceleration, speed, torque and direction of rotation are all recorded by the Bus Terminals and processed in embedded PCs or the higher-level process control system. In addition to a compact design, the integrated Beckhoff control solution impresses through lower system costs, simplified engineering and flexibility. Decentralised I/O stations can be connected via Ethernet, fieldbus or radio to enable remote access.